Most roofing contractors would agree that working with Home Owners Associations (HOAs) could be a challenge. From gestation to completion, the life cycles on these condo projects are long and the personalities within the HOA itself are diverse. The reroofing of The Pines Townhomes HOA (The Pines) in Lomita, California, was no exception. However, NRCA member, Chandler's Roofing of San Pedro, exceeded the HOA's expectations in every area of the project. 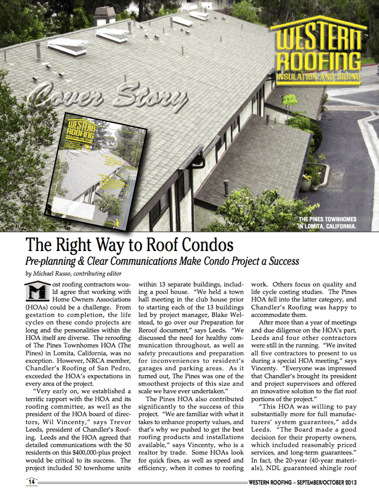 "Very early on, we established a terrific rapport with the HOA and its roofing committee, as well as the president of the HOA board of directors, Wil Vincenty," says Trevor Leeds, president of Chandler's Roofing. Leeds and the HOA agreed that detailed communications with the 50 residents on this $400,000-plus project would be critical to its success. The project included 50 townhome units within 13 separate buildings, including a pool house. "We held a town hall meeting in the club house prior to starting each of the 13 buildings led by project manager, Blake Welstead, to go over our Preparation for Reroof document," says Leeds. "We discussed the need for healthy communication throughout, as well as safety precautions and preparation for inconveniences to resident's garages and parking areas. As it turned out, The Pines was one of the smoothest projects of this size and scale we have ever undertaken." The Pines HOA also contributed significantly to the success of this project. "We are familiar with what it takes to enhance property values, and that's why we pushed to get the best roofing products and installations available," says Vincenty, who is a commercial realtor by trade. Some HOAs look for quick fixes, as well as speed and efficiency, when it comes to roofing work. Others focus on quality and life cycle costing studies. The Pines HOA fell into the latter category, and Chandler's Roofing was happy to accommodate them. After more than a year of meetings and due diligences on the HOA's part, Leeds and four other contractors were still in the running. "We invited all five contractors to present to us during a special HOA meeting," says Vincenty. "Everyone was impressed that Chandler's brought its president and project supervisors and offered an innovative solution to the flat roof portions of the project." "This HOA was willing to pay substantially more for full manufacturers' system guarantees," adds Leeds. "The Board made a good decision for their property owners, which included reasonably priced services, and long-term guarantees." In fact, the 20-year (40-year materials), NDL guaranteed shingle roof Chandler's would install extended the HOA's "reserve" study out by not having to replace the roof as quickly. This saved the residents money on a future roof from day one. It also allowed the HOA to earmark funds for the re-painting of The Pines in the near future. "Even though Chandler's bid was about $140,000 higher than the others, we were looking for long-term results," says Vincenty. The HOA's interest in the project didn't end after Chandler's won the job. Vincenty, Welstead, and job superintendent, Jorge Peña, Sr., thoroughly walked every roof on the complex to visually confirm the existing conditions described by Chandler's initial inspections. The project, which was completed early 2013, also came with a unique set of installation challenges. One of the trickiest was a 6" (152mm) gap, created by the vertical mansards and eyebrow windows that needed to be shingled. Working from scaffolding and tied-off at all times, Chandler's crew applied mastic to the back of each 6" (152mm) section of shingles for extra adhesion. The nailing requirement for each shingle was also increased. "The mansards definitely required some dexterity on the part of our installers," says Leeds. "But, on the positive side, the mansards really showed off the new GAF Timberline American Harvest shingle specified for the project. From a vertical perspective, the look, dimensionality, and coloration of this shingle can really be seen to best effect." However, even on the mansard detail, preplanning helped move the project along smoothly. "Before the project started, we had a long conversation with our crews on proper workmanship, because we didn't want any punch list items on the job that we'd have to come back and correct." Chandler's consulted with the guarantee department of roofing manufacturer GAF in Wayne, New Jersey, to ensure the vertical mansard detail was acceptable to meet the Golden Pledge guarantee. Most of the other sloped roofing sections of the three-story structure featured a standard 4# in 12' pitch, with some areas steeper at 6" in 12'. It also rains in southern California, particularly in the middle of winter, and Chandler's got its share of bad weather during the project. In fact, the job went longer than anticipated, as the contractor never wanted to take a chance with rain disrupting the work. During tear-off and initial installation, as many as 20 crew members worked quickly to install GAF's Tiger Paw underlayment. Tear-off work was prohibited when even a 20% chance of rain was predicted for the area at the beginning of each week. The roofing contractor was able to strategically place its trucks in just the right spots on the project to allow the dumping of tear0off debris directly into the vehicles. But again, without proper pre-coordination with residents, the tear-off process could have been problematic. Chandler's staff explained the whole tear-off process to each resident, especially the part about their driveways and garages being blocked for a limited amount of time. The Pines was constructed in the early 1980s and featured wood shake roofing.  Chandler's had maintained the roof for years under the direction of a property management company. "We finally told the management company that we could no longer make effective repairs," recalls Leeds. "The Pines was overdue for a complete reroof." During an inspection of the existing roof, Chandler's people made a surprising discovery: the wood fascia board running between the upper and lower tiers on the rake edge of the roof had metal step flashing underneath, but no wood backing. The inspector was actually able to reach his hand directly into the attic space. What he found was a pest problem that had bugged residents for years. Old beehives were found in the attic area behind the open fascia. "It was a previous installation error we had never encountered before," says Leeds. "The residents could never figure out how the bees were getting inside the property, but there had to be significant heating and cooling losses from air escaping from the large gaps behind the fascia boards." About 40% of the wood fascia on the project was badly deteriorated and replaced, along with almost all the perimeter plywood butting up to the eave of the roof. GAF StormGuard Film-Surfaced Leak Barrier was used to seal along the roof-to-wall penetration areas. Even rafter supports needed replacement due to dry rot issues with the existing wood shake roof. The gutters weren't in much better shape, and 70% needed to be replaced. Custom Bilt Metals of Chino, California, supplied all the new rain-carrying equipment. The roofing contractor also inspected the pre-existing skylights to ensure they would continue to perform for at least 15 years. About 15 skylights needed to be replaced. For the flat portions of the roof, Chandler's and the HOA agreed on an 80 mil, mechanically fastened PVC single-ply membrane manufactured by IB Roof Systems in Irving, Texas. This highly reflective roof offered the residents a 25-year NDL guarantee. Even though the flat roof is not visible from the ground level, it still earned the project California Title 24 compliance and helps cool the air space beneath the white roof during the summer months. Ironically, working with the HOA was one of the most rewarding aspects of the project for Leeds. "It was terrific to hear that our company was selected due to our presentation, time spent with their roofing committee, and credibility within the community. But, also because our ability to install the GAF and IB Roof Systems with guaranteed that other contractors simply could not offer."